Bonding Strength Testing for Low Temperature Application Adhesive | Piping Technology & Products, Inc. 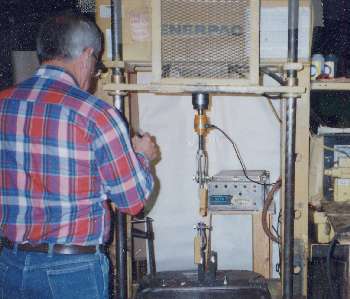 In the picture above, a test of the bonding strength of an adhesive designed for low temperature applications is being conducted. Polyurethane strips have been bonded to metal strips which are pulled apart in a load cell which measures the force applied. 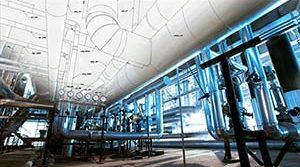 Polyurethane is often specified for components of insulated pipe shoes and supports for cold temperature applications. Polyurethane provides both insulation and load carrying capacity for pipes when it is bonded to a metal pipe shoe or support. 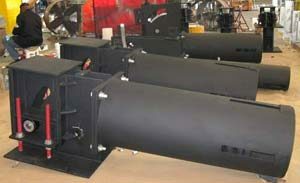 Piping Technology & Products, Inc. fabricates all types of insulated pipe supports. The type of insulation specified depends on the temperature profile the pipe will experience and the loads and movement at the point of application. PT&P provides testing services and pipe support maintenance in the field. Let us help you today!